I remember MaskNought being a deck for a while. Could this do something for that deck? Or StifleNought? Drop one of these turn 1, turn two drop Dreadnought, swing for 12? 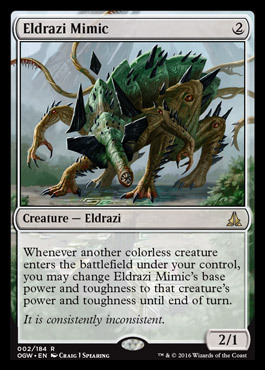 Mimic seems like a slight upgrade to Renegade Doppleganger, which is nice, but hardly untested waters. I vote no. Yeah, that would be consistently inconsistent. The problem is that it's a 2 card combo just like defrosting marit lage, is countered by mental misstep instead of uncounterable (thespian's stage) as well as being hit by every creature removal in the format in response to the trigger. On the other hand, when it works you get a 12/12 with no abilities instead of a 20/20 flying indestructible! The only upside is that repeal would cost 2U instead of U to bounce the contraption. Hm. I doubt it will make it.